My personal tribute to the pre-2004 Australian and overseas performances of actress Naomi Watts (20 pages - completed 2004). 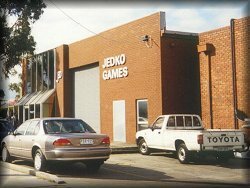 A pictorial record of my 1989 and 2001 visits to the makers of the Dungeons and Dragons fantasy role playing game (12 pages - completed 2004). A pictorial tour of Point of View film locations situated in Vancouver, Canada (38 pages - completed 2002). Guide to the Anthony Larme Computer Games Censorship Collection (20 pages - completed 2002). University assignment for Information Management (4 pages - completed 2002). A pictorial tour of Heavenly Creatures film locations situated in and near Christchurch, New Zealand (25 pages - completed 2001). World's leading fan pages for the Phantasmagoria computer games (52 pages - completed 1998).